New for 2016 are the H855D and LH855D harvesters equipped with the fuel-efficient Tigercat FPT N67 Tier 4f engine operating at 210 kW (282 hp) for North America and Europe. Tigercat FPT engines offer improved reliability, lower long term maintenance costs and full support by Tigercat and the Tigercat dealer network. Tigercat will continue to offer the H855C and LH855C for markets that do not require Tier 4 emissions compliance. The H855D series harvesters are available with two-piece or telescopic ER boom systems. 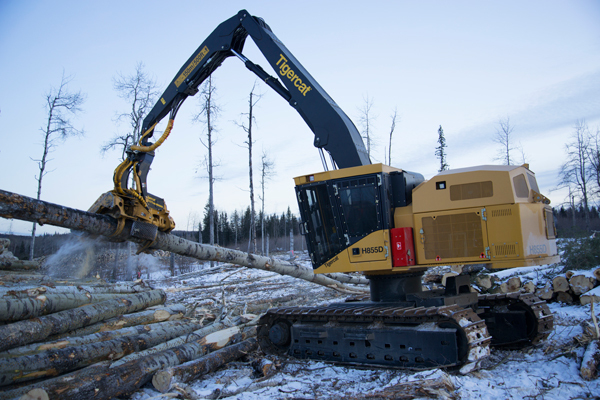 Tigercat’s patented ER boom technology allows the machine operator to extend and retract the boom on a horizontal plane smoothly and quickly using a single joystick. The stick boom or ‘reach’ joystick controls both the main and stick booms simultaneously, resulting in the attachment moving either away from or toward the operator. The main boom and tilt functions operate in the traditional manner to adjust the height and angle of the attachment. The engine and hydraulic system are specifically designed to achieve maximum performance and minimum fuel consumption in harvesting and processing applications. High horsepower allows the carriers to maintain hydraulic flow as the pressure increases, maintaining quick feed speeds and significantly boosting productivity. The H855D series carriers are an excellent fit with the Tigercat 575 harvesting head. For steep slope applications, the LH855D features Tigercat’s patented levelling system, providing exceptional stability in steep slope applications. It uses two massive hydraulic cylinders and heavy steel sections for a solution that is both simple and robust. Due to the unique geometry of the levelling system, the machine is well balanced on slopes. In addition, the ramped undercarriage (both the front idler and the rear gearbox are set higher than the centreline of the undercarriage) allows the machines to easily drive up over rocks and stumps.